As soon as my little sister, Raegan, was born I could tell our hearts were already one. Our bond was stronger than anything I had ever felt in my 3 short years. I loved the role of being a big sister right away. Raegan looked like one of my dolls and I thought she had the cutest red cheeks and a perfect little nose. It was like I had a “mini-me” and I wanted to tell everyone about her. I was doing everything mommy and daddy told me to make sure I was the best big sister I could be. On the day we were planning on going home, we were all dressed up like we were twins and I was so excited I couldn’t wait to show Raegan all of our toys and her new room at home. The doctor checked on everything one last time before leaving and said she heard something that was not right in her little heart – we had to stay one more night. The next day, a new doctor looked at Raegan’s heart and we were sent to a new hospital in a new city a couple of hours away from home. We showed up at Children’s of Alabama and it seemed like everyone that came to see Raegan was poking her and mommy and daddy were very sad all the time. Even though I didn’t know exactly what was going on, I knew I had to love my little sister with all my healthy heart since they say hers is not strong enough. Since mommy and daddy have had to be away from home for five months now, they have been living at the Ronald McDonald House in Birmingham. I have to stay at home and go to preschool, but I visit whenever I can. 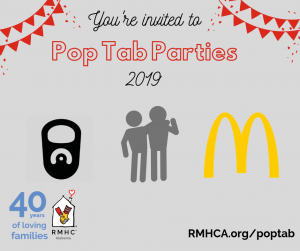 The Ronald McDonald House is so much better than a hotel — there are even a lot of kids there to play with. It is nice to be able to sleep and play somewhere that is so close to Raegan. When I am at the Ronald McDonald House I get to visit her which is my favorite thing to do. I think my visits are Raegan’s favorite too – but don’t tell mommy and daddy. I want to be a good big sister so I try to visit as much as I can, which means I stay at the House a lot. I love being able to take the short walk over and see her, but I don’t like all the other people fussing over her. I try to make sure they all know that she is my little sister. I can’t wait until we can bring Raegan back to the Ronald McDonald House until she is healthy to go to our real house and then we can play together whenever we want and continue to be best friends. Raegan Preslyn Morrell was born October 22, 2014 weighing 6 lbs. 8 oz. 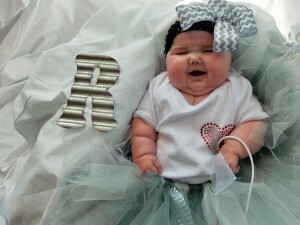 She was diagnosed with an interrupted aortic arch, double outlet right ventricle complete heart block and in December of 2014 Raegan was placed on the UNOS (United Network for Organ Sharing). 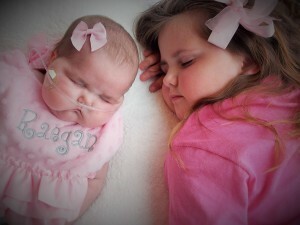 On March 23, 2015, Raegan received her new heart. Show your support for Raegan and her family by donating to the Ronald McDonald House and wearing #Red4Raegan.